Dental Associates provides dental implant treatments in Farmington, CT. Call us today at 860-677-8666 to learn more and schedule your appointment. Dental implants replace natural tooth roots, providing a strong and stable foundation for replacement teeth. Made of a sliver of biocompatible metal known as titanium, dental implants actually fuse with the jawbone in a process known as osseointegration. This process takes several months, after which abutment posts are attached to support the final restoration. 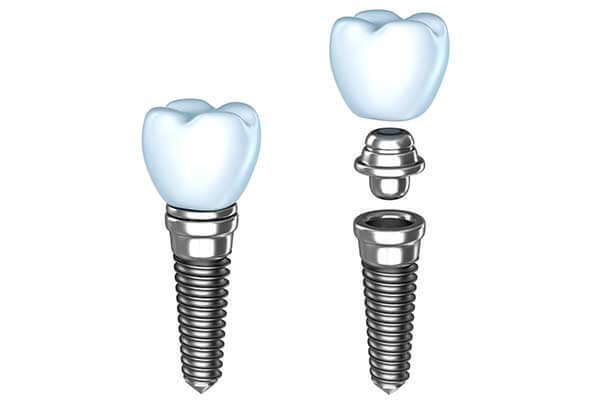 For a single tooth dental implant, one implant supports one crown. This is an easy way to achieve a stable, natural, highly aesthetic replacement for one missing tooth. An implant supported bridge is used to replace a run of three or more missing teeth. 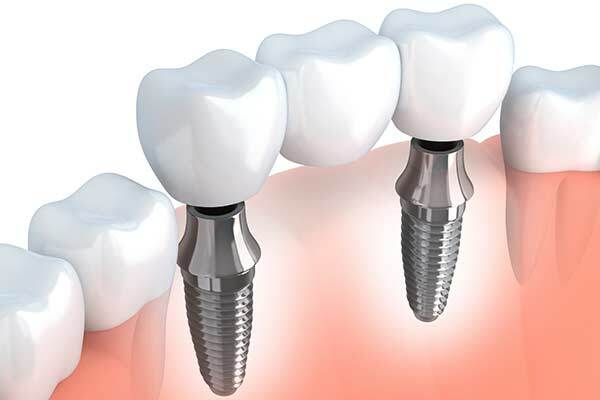 Implants are placed at both ends of the span, and are used to secure a fixed bridge of replacement teeth. Unlike a traditional bridge, which damages the structure of the adjacent natural teeth, an implant supported bridge does not affect the surrounding healthy teeth at all. Patients who are missing all or most of their teeth may prefer implant supported dentures over traditional dentures. While traditional dentures rest on the gums, often leading to slipping, pinching, and trouble chewing, implant supported dentures are entirely reliant on dental implants. At least two implants are required for snap-on removable dentures, which snap onto the implants for stability but can be removed for cleaning or sleeping. A fixed implant supported denture requires at least four implants. 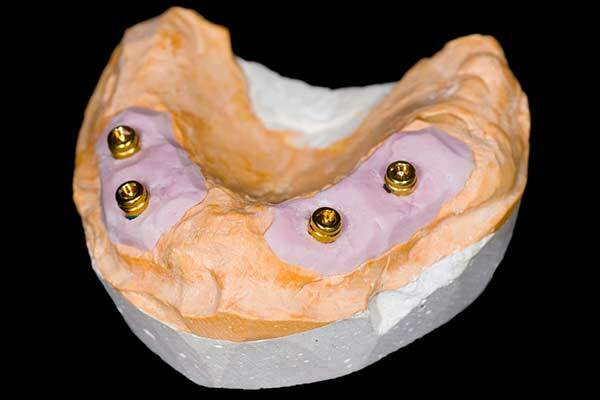 The denture is affixed to the implants, and functions just like regular teeth. It is not removed for sleeping or cleaning. The All-on-Four is a unique alternative for those who are missing all of the teeth on the upper or lower arch. Using just four carefully-placed implants, we can permanently attach an entire arch of replacement teeth. Rather than waiting for months for osseointegration, as is required for other implant solutions, the All-on-Four uses immediate-load implants. That means you can leave the same day with your new replacement teeth. If you would like to learn more about how dental implants can restore your smile, please call Dental Associates today at (860) 677-8666 to schedule your appointment. 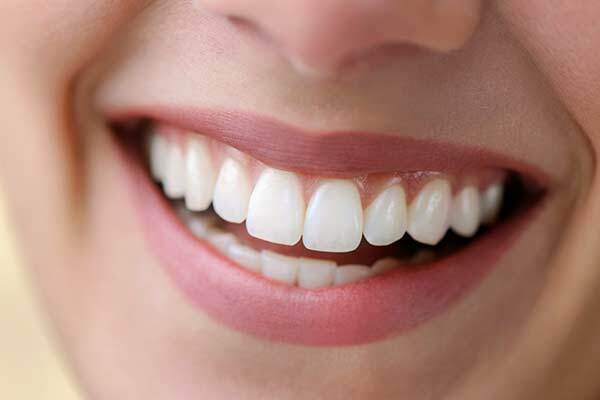 If you are searching for dental implants in Farmington, contact Dental Associates, LLP today.